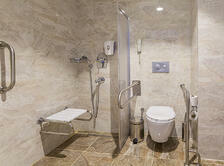 Here are some things to consider when designing ADA compliant bathrooms. Accessible bathroom modifications often involve widening doorways to at least 34 inches and making sure there’s enough floor space for wheelchair users to turn. Doors that swing outward rather than inward provide more space in the bathroom, although pocket doors in small spaces is also an acceptable option. The bathroom should have space for two people if the person with a disability requires care or assistance getting in and out of the tub or shower. 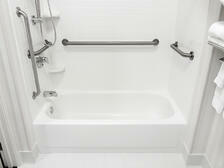 Install grab bars in all bathing areas. This means two bars in a tub at standing and sitting positions, and along all three walls in the shower. A rolling shower seat or fixed seat can be useful for some users. Seats should be between 17 and 19 inches high. 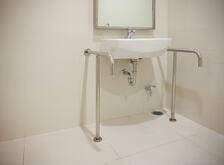 A removable stool will help in households where people with and without disabilities share the same bathroom. Nonslip floors are essential to preventing falls in the tub or shower. Install anti-scalding valves to keep water temperatures at a safe level and limit the shower/tub water temperature to 120 degrees. Curbless showers can help people who use walkers or wheelchairs or who are just at risk of falling. These showers are level with the floor and slope downward to let water drain. Sink countertops should be no more than 30 to 32 inches high on the top side and no higher than 29 inches underneath to accommodate wheelchair users. The sink should have an opening of at least 32 inches underneath for wheelchair users. Sink counters should be no more than 21 inches deep to make things easier to reach. Drop-in sinks are an option as long as their drain pipe doesn’t hinder wheelchair users from approaching and using the sink. Protect against burns by covering drain pipes with an insulated heat guard. Install magnetic touch latches or C-shaped handles to make sure drawers and cabinets are easier to open. ADA compliant bathrooms have toilets that are between 17 and 19 inches high, a comfortable height for all users. Toilet paper dispensers should be at a comfortable height and placed so that users don’t have to reach behind them. Put at least one grab bar on one side of the toilet, although the ideal accessible bathroom would have two support bars 36 inches apart. Proper lighting is an important element of safety. Make sure light switches are low enough for wheelchair users to reach them. Motion activated lights are an option for people who may have trouble using light switches. 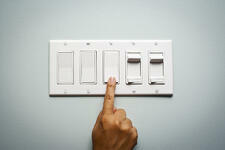 You may also want to consider switches that use a push button or toggle for people unable to make a pinching motion. Dimmers can provide extra brightness when needed or softness to avoid glare. We all deserve to feel safe and comfortable in our homes. But for people with mobility issues, this can be difficult. 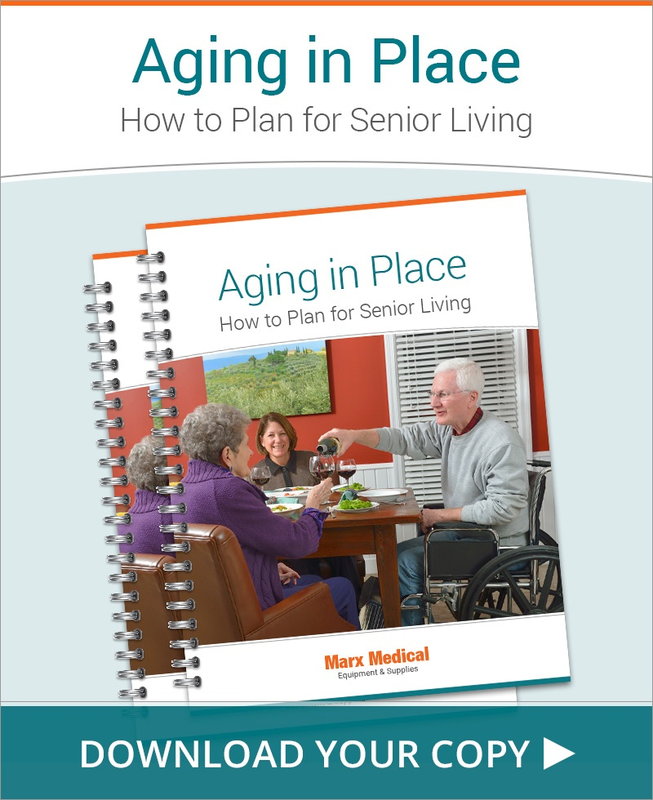 Let Marx Medical help ease your burdens. We provide a wide range of home modifications, including ADA compliant bathrooms. We offer free assessments and drawings, along with evaluations from physical therapists and installations done by trained technicians. Contact us today to learn how we can make your bathroom a safer space.